Original content posted March 2016. Updated November 2018. I love how food has the ability to transport you to a specific time in your life. This Cheesy Corn Casserole? It brings me to the hectic days of welcoming a new baby into our home, baby number three specifically, and the kindness of a friend who made us an incredible meal that included this amazing side dish. We INHALED it and I found myself e-mailing a request for the recipe that night. Pretty amazing given that I’m sure I was in that newborn fog and likely hadn’t even gotten to shower that day. 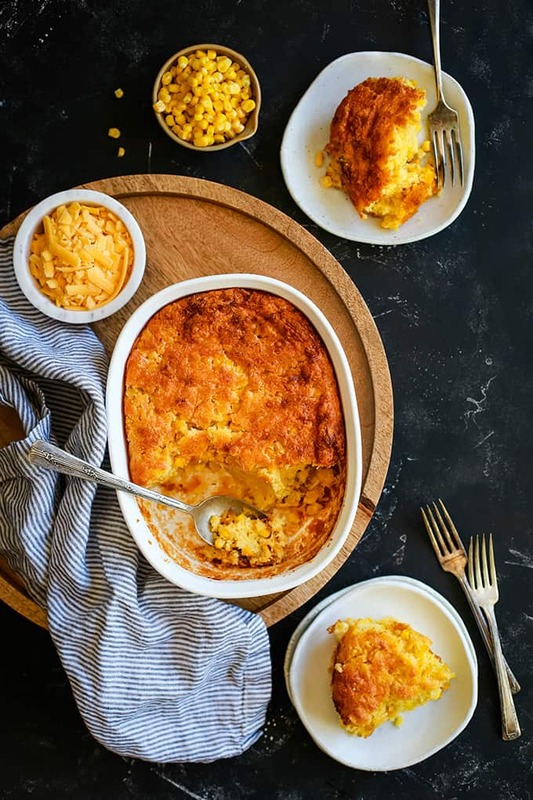 This comforting six ingredient Cheesy Corn Casserole takes just 10 minutes to prepare and will be requested for Sunday dinner, holiday dinners or any day ending with the letter Y. This is the perfect side dish that I often serve along side my Slow Cooker Honey Mustard Ham, Easy Hash Brown Potatoes and Dyed Deviled Eggs. You now know the reason why we enjoy this side dish quite frequently! It’s actually been used as payment to my sister-in-law for babysitting for us on occasion as well. You know what they say, food is the way to the heart! SIDE NOTE: If you’re looking for an easy corn casserole recipe with a bit of a kick, you’ll definitely want to try my Southwest Green Chile Corn Casserole. Are you ready to make this Cheesy Corn Casserole the star of your dinner table? If you’re feeding a crowd, no problem. I often will double this recipe and put it into a 9″ x 13″ casserole dish. Simply double the ingredients required but keep the cooking time the same. 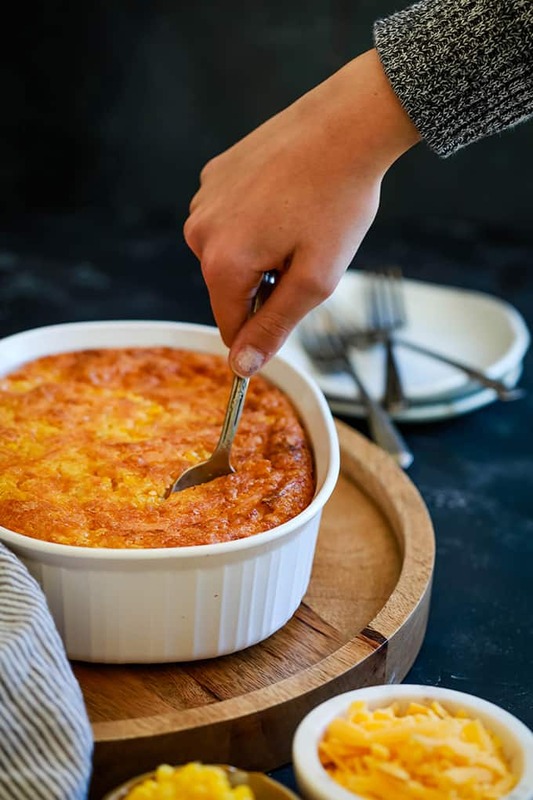 When I received the return e-mail with the requested Cheesy Corn Casserole recipe, I couldn’t believe how easy it was. 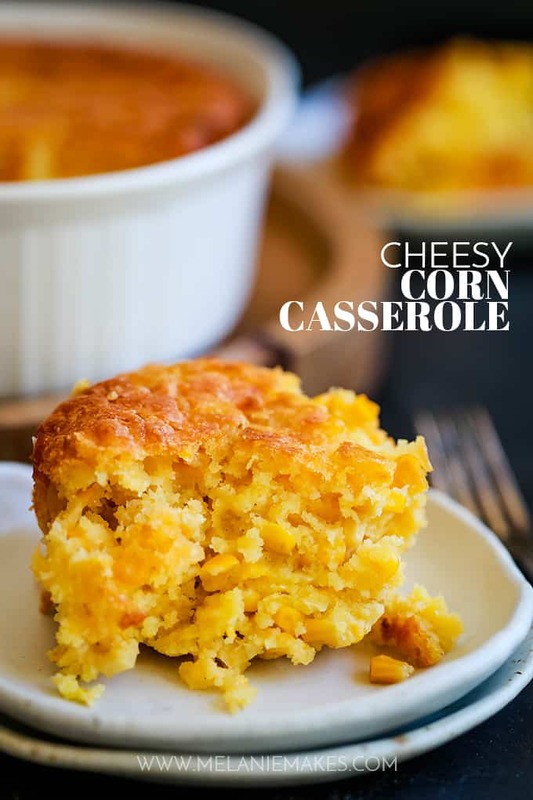 It requires just six ingredients – a can of creamed corn, a can of regular corn, a box of Jiffy cornbread mix, eggs, cheese and vegetable oil. In a medium bowl, add creamed corn, corn, cornbread mix, eggs, cheese and vegetable oil. Pour batter into greased 2 quart casserole dish. If desired, add a bit more cheese to the top to form a crispy cheese crust on the top of the casserole. Bake at 350 degrees for 55-60 minutes or until golden brown. 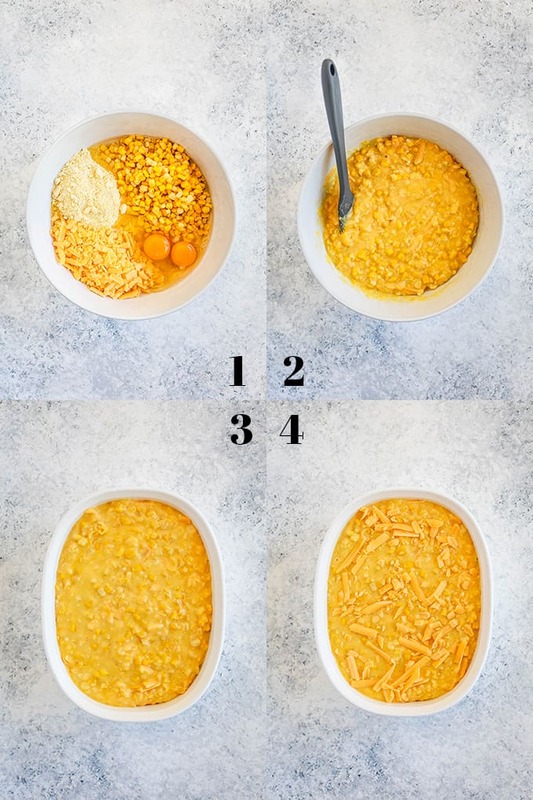 This comforting six ingredient Cheesy Corn Casserole takes just 10 minutes to prepare and will be requested for Sunday dinner, holiday dinners or any day ending with the letter Y. In a medium bowl, stir together all ingredients until just combined. If desired, add a bit more cheese to the top to form a crispy cheese crust on the top of the casserole. Bake for 55-60 minutes or until golden brown. In my opinion, you can never have too many corn side dishes at your table and I’m guessing you might agree. You’ll definitely want to add this spicy Bacon Jalapeno Cream Corn, refreshing Mexican Street Corn Pasta Salad and comforting Creamed Corn Macaroni and Cheese. What about adding cooked bacon or cooked breakfast sausage? Hey, Nancy - I'm sure you could, I just haven't tried that variation. Yet! 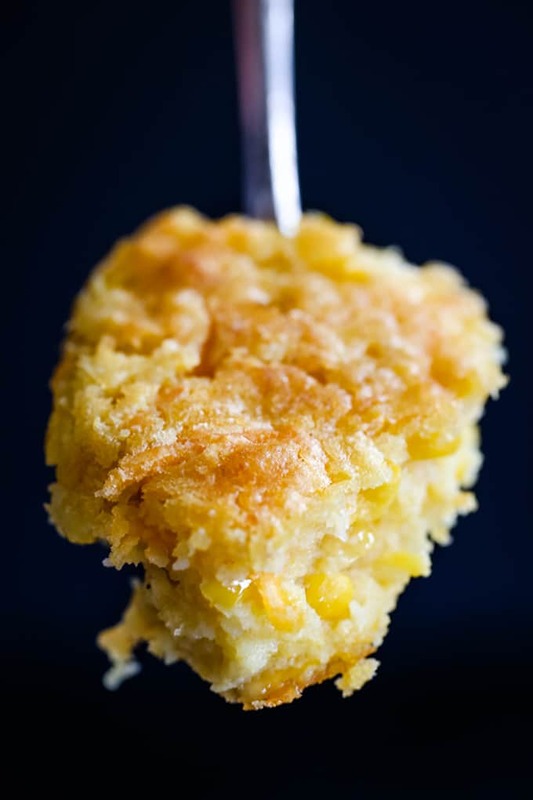 I’ve made this cornbread for over 30 years and it can be very versatile. I often add half a pound of cubed pepper jack cheese and some spicy salsa. There are lots of additions that make this dish even more enjoyable! It sounds like you enjoy it as much as I do, Mary! Hi, Steph - I haven't tested this recipe in the slow cooker, although I should! This is pretty much comfort food where I'm from. I love that it's quick and easy to get together. I'd definitely try this any time of year! We make it all the time, Sandra! I made this for Thanksgiving and it was such a hit! Thank you! Thrilled that you enjoyed it and took the time to let me know, Patricia! This looks really amazing! Definitely worth a try for Thanksgiving! This is in our future! So easy and delicious! I should make it this week! Corn casseroles are my favorite! I can never get enough! Now this is my favorite side dish. It's so fast and easy. I I have no words to say how much this is the perfect recipe for my family. You are GENIUS! And I'm happy to save your recipe. Have you ever tried freezing this ahead of time? We're going on vacation, and I'm trying to make some things ahead of time. 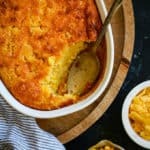 This is the best corn casserole I have ever tasted! My entire family gobbled it up! Thank you for the simple recipe! You are so welcome, Rhonda - so glad you enjoyed it as much as we do! That seems like a lot of vegetable oil? Is that correct. Hi, Gayle - The amount of oil is correct! Hope you'll give it a try! Jessica, your comment totally made my Thanksgiving - thank you! 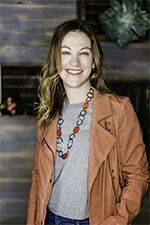 So glad that it was a part of your family's celebration. Thank you so much for taking the time to let me know you enjoyed it. So appreciate it! Hi, Margo - I think the honey cornbread mix would work just fine! Let me know what you think if you give it a try! I doubled the recipe and put batter in a 9x11 disposable pan. I prepared the batter last night. I plan on bringing it to room temperature and then baking today. Fingers crossed. I'm hoping it bakes well even though the pan is smaller than the recommended size. Let me know how it works, Samanatha! Happy Thanksgiving! 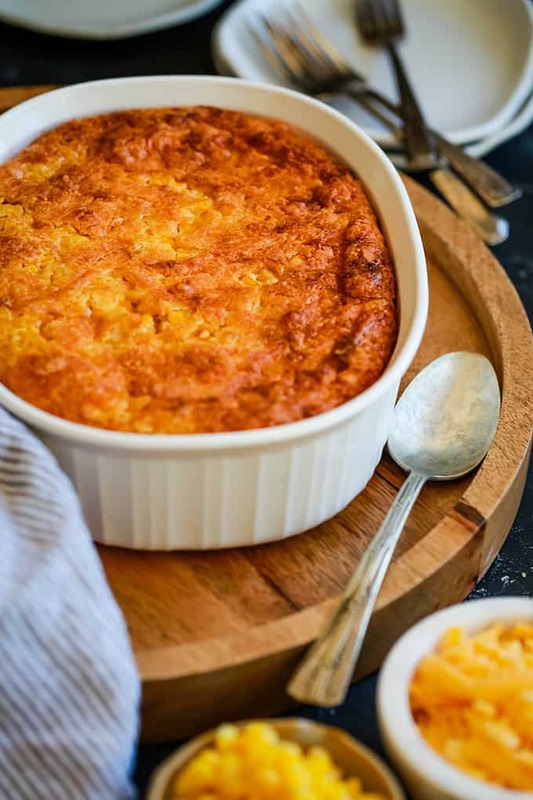 This version of corn pudding sounds great!! I am going to use this one for Thanksgiving!! Have you ever tried it with green and red peppers? My recipe has the peppers but no cornbread, but since we all love cornbread it should be a hit. They sell canned corn with the peppers, but usually I just cut up fresh ones. But I am definitely making it and I am going to add the peppers!! Your recipe is a lot easier and quicker!! Hi, Michelle - I have used peppers in this recipe but honestly prefer it as is. Can't wait to hear what you think! I made this for a family gathering & have been requested to make it every time we get together. BTW, I substituted applesauce for the oil, and it was DELISH ! So glad you enjoyed it, Bev! Thank you so much for taking the time to let me know, so appreciate it! This looks so good and will share this recipe. Thank you, Deborah - appreciate it! Can I make this ahead of time to bake the next day? I wasn't sure if it'd soak up the moisture and be dry. Hey, Emily - I honestly haven't tried making it ahead of time. It's so easy that it takes just minutes to prepare so I'd wait and just prepare it the day that you're going to enjoy it. Thanks Melanie for an awesome recipe. It sounds like the perfect dish for an old fashioned gathering, and easy enough for ME to prepare. Cooking time the same for a doubled recipe in a disposable pan? I can do that. I just made this dish for a Christmas party at my school today. It was demolished. Someone commented that they really did not like corn but it was so good she just had to have thirds! It was amazing and I like how I can add additional ingredients like peppers in the future... Love it! What a compliment, Marina - so glad that it was such a hit! Thanks so much for taking the time to let me know that it was enjoyed! So glad you enjoyed it, Sisi! Hello! I was just wondering if the batter could be prepared the night before and be used the next day? Hi, Tiffany - I haven't tried this. The batter is so easy to stir together and doesn't take any time at all that I've never considered it. Hi there! Can this be made the night before? If so, how would you store it? I want to make this for a work potluck but dont want to get up at 4:30 am just to make it:) thank you! Hey, Ekh - I'm thinking you'd be okay. I'd store in covered in the fridge and then just reheat, covered, so that it's warm when served. Enjoy! Try the rolls of creamed corn, they're in the freezer section and look like a roll of sausage. I like to mix white and yellow corn together and the only seasonings I use is half a stick of butter~ or more with salt to taste and lots of black pepper. It tastes like it came from the field!! Help!!! Melanie, can I double this recipe???? Also if yes, the size pan? People are coming over and have the stuff doubly and wanted to reach out first. Thanks in advance ???? Hi, Marie! Thanks so much for your kind words! I double this recipe frequently since we enjoy it so much. I simply use a 9x13 pan and follow the same cooking time. Hope that helps! Thanks for the suggestion, Beth! Can I make this without the creamed corn? That's the only ingredient I don't have right now. Hi, Jordann - I've never tried it without that ingredient so I can't tell you for sure. Let me know if you give it a try that way! Any suggestions for using fresh corn? I dont buy a lot of can food, I prefer fresh... This looks sooo good though! Hi, Alley - Fresh would be fine except for the creamed corn substitution. I'm not sure it would work well given the difference in consistency. Hope you enjoyed it, Robert! Came across this recipe on Pinterest, and made it for our church Pot Luck dinner, and it was the hit of the party!!!!! Thank you for sharing it. ?? Hi, Ilka! You totally made my day - thanks not only for trying my recipe, but for also letting me know it was such a success! Is this giveaway over? I cant locate the giveaway widget to enter. Your link pictured in my screenshot linked below, gets this result:https://www.dropbox.com/s/hpcwrpyt2izy7bo/Screenshot%202016-03-17%2020.23.18.png?dl=0"The page you are looking for isn’t here.Did you get here from a link on PromoSimple? If you did, please email us at support (at) promosimple (dot) com so we can correct our mistake.Did you get here from a link on another website? Perhaps the link is outdated or misspelled. If so, please email us at support (at) promosimple (dot) com with the link you were trying to reach.To visit the PromoSimple.com homepage, please click here. Thanks! The PromoSimple Team"Am I the only one having this problem? I've made something similar to this and we loved it! Can't wait to try yours! So sweet of your friends to bring you dinner! Let me know if you give it a try, Angie! Love, love cornbread. It's such a southern tradition I mastered. Usually eaten with Fried Chicken or Stewed Chicken. 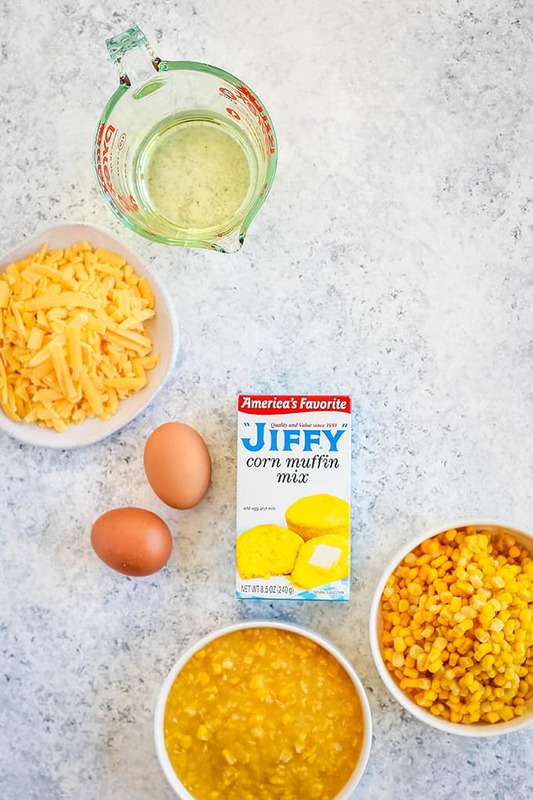 I believed I have a recipe with Jiffy mix with Corn, but never with cheese. Oh my gosh...it's a must try. Looking forward to making this for our next family gathering. Thankful for this one‼️?? Hope you love it, Melissa - let me know if you give it a try! Your cornbread casserole looks so delicious! My kids LOVE cornbread! Crossing my fingers on your giveaway...my husband gave me my first piece of Le Creuset for Christmas and it is awesome! I wish I could replace all my cookware! I'm such a fan of LeCreuset and typically ask for a piece for my birthday. No other gifts need to apply! I have no doubt you would, Miryam - thanks so much for your kind words! Just wanted to know if this can be frozen after baked. Hi, Marina - I've never attempted to freeze it as it disappears so quickly so I can't say for certain. If you try it, I'd love to know what you think! I am seriously in love with this casserole! What a dish! 10 minutes? Love the slightly crisped topping with the creamy corn inside. I'll make this often! You totally nailed it, Patricia - those crispy edges are my favorite! This casserole looks and sounds amazing! 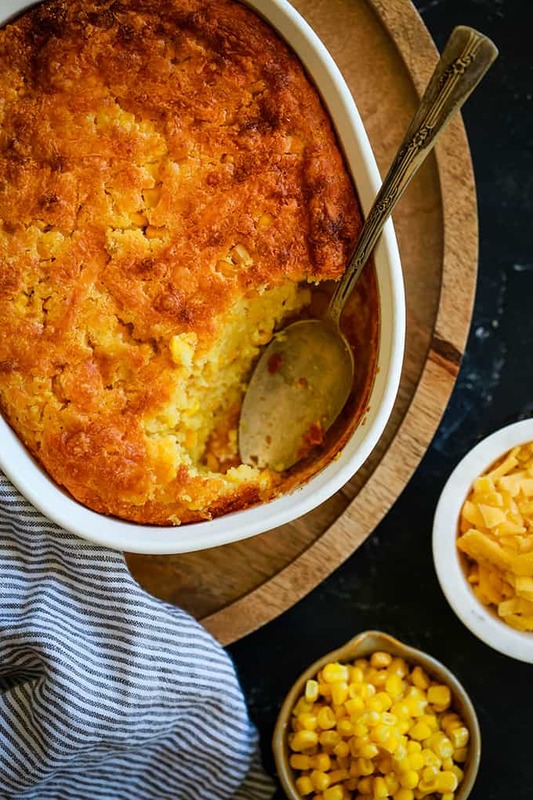 I'll have to try it - my kids turn up their noses big time to cornbread and I think this has a lot more flavor than the recipe I have been using! Thanks, Laura! And your kids don't like cornbread? How is that possible?! I need to hide it from mine so they don't eat it all. ;) Let me know if you give this recipe a try! This recipe looks so good! Looks like a corn pudding recipe that a Mexican restaurant called Chi Chi's had, or still has as far as I know. One problem I encountered when entering the contest....when I pinned it to pinterest, it pinned as a black bean hummus recipe for some reason. I'd like to pin it so I don't lose it....and ideas? Hi, Sandra - I haven't substituted my homemade cornbread for this as I'm thinking it would throw off the ratio for the other ingredients. If you give it a try, let me know what happens!